The Pareiasaurs were large late Permian herbivores. They were heavy ungainly animals, frequently the size of an ox, with capacious bodies, strong limbs, broad feet, and thick solid skulls ornamented with bizarre knobs and ridges. They were armoured with bony scutes or osteoderms set in the skin, The largest types were 3 metres long and about 1 1/2 meters tall, with an advanced upright limb posture to support the weight of the body. The leaf-shaped multi-cusped teeth (left) resembled those of iguanas, caesids, and other reptilian herbivores. This dentition, together with the deep capacious body (which obviously housed an extensive digestive tract) are proof that these fearsome-looking animals were in reality inoffensive herbivores. Pareiasaurs appear very suddenly in the fossil record. It is clear that these animals evolved from Rhipaeosaurs to fill the large herbivore niche (or guild) that had been occupied early in the Permian period by the Caesid pelycosaurs and before then the Diadectid amphibians and Edaphosaur reptiles. In fact it may well have been the extinction of the Caesids created an ecological vacuum that enabled the Pareiasaurs to appear and suddenly diversify as rapidly as they did (within the span of only two million years). Although the last Pareiasaurs were no larger than the first types (indeed, many of the last ones became smaller), there was a definite tendency towards increase of armour as the group developed. It has been often suggested that these animals were semi-aquatic. Skeletons have been found in a standing position, indicating that the animals became mired in the mud and swamps while feeding on vegetation. Their remains are also consistently found in channel stream deposits (riverbeds). Of course, this does no mean that they were semi-aquatic; and actually the fact that the animals became stuck argues against aquatic adaptations (a aquatic animal would not likely become stuck, whereas a terrestrial animal would; e.g. the remains of sauropod dinosaurs, which were as terrestrial as elephants, are sometimes found in this position). A more plausible explanation is that these were fully terrestrial animals that frequented watercourses in order to get at the succulent aquatic vegetation. It has recently been argued that Pareiasaurs may have evolved into turtles. They had turtle-like skull features, and several genera had bony plates in the skin, possibly the first signs of a turtle shell. However, the case for turtle ancestry is not proven. Recent reports of a slender stapes (a sound-conducting middle ear ossicle) indicate that pareiasaurs had an efficient ear drum (tympanum) and were able to hear high frequency airborne sounds. Modern equivalent: giant land tortoise??? The skull is short, broad (laterally expanded), massive, and strongly sculptured and knobby. The sutures are not clearly distinguishable. The quadratojugals (cheekbones) project laterally downwards (almost like the hanging "jowls" on a cartoon "Looney Tunes" butler). The orbits (eye sockets) are relatively small, and laterally (side of the head) placed. There is an opening for the pineal body ("third eye", use to regulate metabolism in the case of seasonal extremes). the brain-case is long and low, the ear-cavity separated by bone from the brain cavity. The tabular and post-parietal bones of the skull are on the dorsal (upper) surface only. The jaw articulation is well forward of the occipital condyle (the connection between the skull and vertebra), increasing the mechanical efficiency of the jaw musculature while decreasing the gape. The palate (left) strongly integrated with the base of the braincase and the skull margins. The bones of the palate are fused, and bear several series of small teeth. The teeth are conical with leaf-shaped crowns. Those on the margins of the jaws area arranged in a close regular series. There are about eighteen presacral (neck and trunk) vertebrae, each with deep articulation for the ribs, and generally four sacral vertebrae. The sacral vertebrae are unfused (an inefficient arrangement). There are thirty caudal (tail) vertebrae with the anterior ones bearing short ribs. Generally the tail is quite short. The pelvic bones are massive and ossified. The scapula is much longer than in other primitive tetrapods, and the pelvis has an almost mammalian configuration. This may have helped accommodate muscles that moved the rear limb in a manner similar to the fore and aft gait of mammals. The humerus is short, massive, and expanded at the ends; the ulna very stout. The hind limbs are slightly shorter than the fore-limbs. The stocky limbs are held close to the body to support the weight. Both fore and hind feet have five digits, which are equipped with broad claws. Remains of Pareiasaurs are quite common in the Lower Beaufort Series of South Africa, and a great many generic and specific names were originally proposed. It would be very unlikely that such a large number of similar species would co-exist in the same time and space, and it is now recognised that many of these different types are actually the result of individual variation, growth stages, geological deformation of fossils, etc. Now no more than five genera are recognised from South Africa, four from Russia, two from Europe and one from China. Of course the original diversity of these animals would of been a lot greater, but it should be remembered that only a tiny fraction of all the species that ever lived have ever been fossilised, and only a fraction of them have been discovered as yet. The following (still under construction) is a review of the dozen or so known genera of Pareiasauridae. comments: Despite its large size, Bradysaurus is actually the most primitive known genus of Pareiasaur. The Bradysaurs can be considered the ancestral type from which the others developed, even if it lived at the same time as one or two other genera. It can be assumed that Bradysaurus evolved somewhat earlier in time, during the Wordian epoch (Eodicynodon zone). 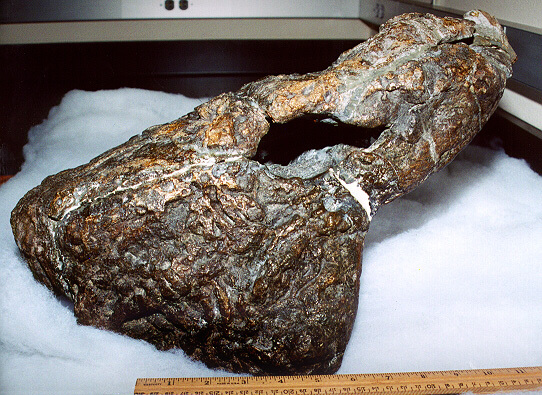 Fossils are rare in the Eodicynodon zone, which may explain its absence. The skull is large, broad, flattened, and rounded at the front. The skull-bones are coarsely sculptured and knobby, the sutures between them not clearly visible. The marginal teeth are high-crowned with only a few cusps, this being a primitive characteristic. The cusps consist of a terminal group of three cusps, the anterior with one to three and the posterior two to three cusps. The phalangeal count is 2,3,3,3,2 on the fore-foot and 2,3,3,4,3 on the hind. The whole body is covered in thin dermal scutes, which are quite smooth over the back. The armour is not as heavily developed as in later forms. The top of the ilium is vaulted. There are 5 cervical, 15 dorsal, 4 sacral, and about 39 tail vertebrae. Kuhn lists no less than nine species for this genus, but this is certainly an excessive number. Boonstra distinguishes only four species on the basis of tooth structure, two of which Kuhn places in the genus Embrithosaurus. I have decided to take the more cautious position and only have two species in this genus. This subfamily includes the "typical" Pareiasaurs. The heads decorated by knobs and ridges. The teeth each have nine cusps. The upper margin of the ilium is flat, never vaulted. The surface of the back is armoured to varying degrees with bony scutes. Some forms like the ancestral genus Embrithosaurus had only weak armour; while later forms like Pareiasaurus, Scutosaurus, and Anthodon were well protected. The limb posture is advanced and upright to support the weight of the body (graviportal). Dr Kuhn (Cotylosauria, p.75) includes the following genera: Pareiasaurus, Pareiasuchus (Dr Carroll includes this genus under Pareiasaurus), Embrithosaurus, Anthodon, Scutosaurus, Shihtienfenia, and Nanoparia. Von Huene however places Scutosaurus, Shihtienfenia, and Nanoparia each in their own subfamilies. The body is lightly armoured with thin, smooth dermal scutes. This genus would seem to be ancestral to Pareiasaurus. As the name indicates, the skull is long and narrow. This would seem to indicate a different lifestyle or diet to other parieasaurs. This species was made the type for " Dolichopareia"
The type species. This is the most advanced species of this genus, as indicated by the teeth, which have nine cusps (in three groups of three). The bony dermal plates are thin and smooth. The ulna is without an olecranon process. comments: This genus includes a number of large Pareiasaurs. The skull is broad and the snout short. There are 4 sacral vertebrae. The phalangeal count of the fore-foot is 2,3,3,3,2. The armour is well developed, with several rows of heavy scutes. There are 14 pairs of low, broad-crowned teeth, each with 9 to 13 or more cusps (depending on the species). This early form is one of the first representatives of the genus. It was originally included under the genus Pareiasuchus. The snout is heavily armoured, and bears a horn-like boss. The teeth are equipped with 11 (or possibly 13 or 15) cusps. This is a large animal; the skull is about 50 cm in length. This species might be ancestral to Pareiasaurus peringueyi. This late species is the type species for Pareiasaurus, and represents the culmination of this lineage. The armour is well developed. There are 14 pairs of teeth, each with 9 to 11 cusps. The short deep skull is about 40 cm in length. Note the extended quadrato-jugal region. comments: this small form combines the primitive feature of interpterygoid fenestra with an advanced feature of turtle-like armour. The skull is small and quite lightly built. The cheekbones extend downwards to a great degree, but with a smooth unornamented surface. There are 11 to 14 pairs of overlapping teeth, each with 8 to 15 cusps. The type species, is known from an incomplete skull and several anterior vertebrae. The teeth are regularly spaced and have at least 9 cusps each. 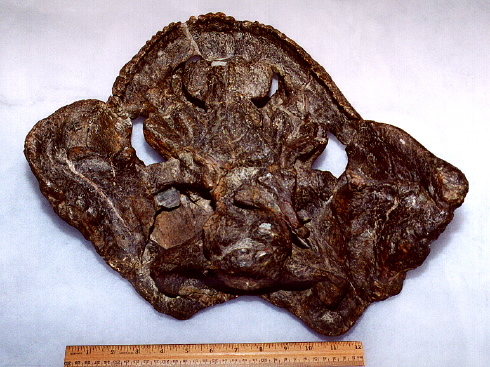 A large species for this genus, known from an incomplete skull almost 30 cm wide. The teeth only have have 8 cusps each. This probably belongs to a distinct, perhaps unrelated, genus. locality: Sokolki, Malaya Severnaya Dvina River, Arkhangelsk Region, northern European Russia. more drawings of the skull of Scutosaurus here The skull (left) is very broad, flat, and strongly sculptured, and bears bony protuberances in the jugal (cheek) and rear regions. As with some species of Pareiasaurus, with which it is clearly related, the quadrato-jugal or cheekbones extend outwards and forwards, makings an angle of about 120o with the maxillary border. 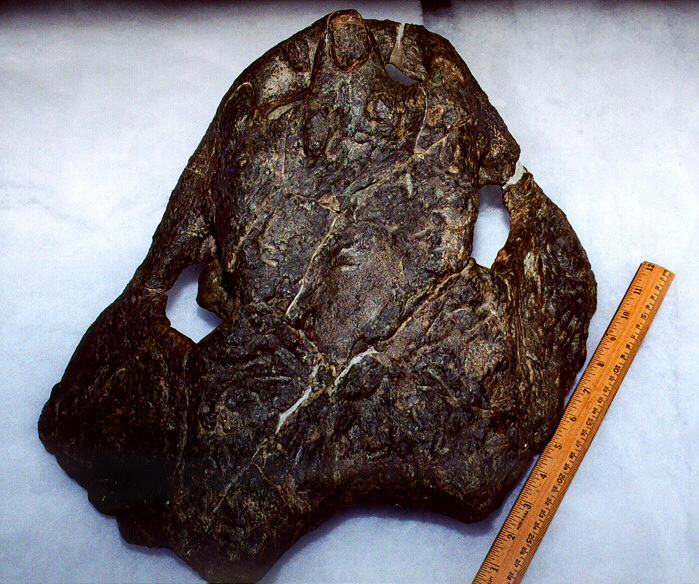 The skull shown on the left is about 50 cm wide. The skull of this pareiasaur is unknown. It is known from a number of isolated vertebrae, jaws, and limb-bones and an incomplete skeleton, all from a single locality. Shihtienfenia is unusual because of the presence of 6, rather than the usual 4, sacral vertebrae, and may belong in a separate subfamily, although Oskar Kuhn includes it under the Pareiasaurines in his monograph. As with the Pareiasaurines the upper margin of the ilium is flat. No dicynodonts are found in association, so these animals obviously lived in a separate environment. This is a small specialised late lineage, characterised by large spikes or backwardly curved "horns". They are known from the late Dzulfian age of Northern Pangea (Scotland and Russia). In the Moscow Basin (middle part of the Vyatskian horizon), Elgiinine pareiasaurs are associated with therapsids like Nanocynodon and Dicynodon, Proterosuchid Archosaurs, and Bystrowianid amphibians. They would represent a slightly later (say a million years or so) time period than that of the giant Scutosaurs. comments: These small parieasaurs represent the specialised end of the line for these great herbivores. The increasing aridity of the later Permian was drying up the swamps and pools where they liked to feed. left: illustration from Karl A. Von Zittel, Text-Book on Paleontology, Macmillan & Co., London, vol.2 , pp.242 The type and only species - Elginia mirabilis Newton, is known only by the skull, which is about 15 cm long, triangular, coarsely sculptured, and armed with a number of paired bosses or spines. The upper jaw bears 12 pairs of teeth, each with 9 or 10 cusps. The teeth are slightly constricted at the base and serrated at the crown. This is an unusual small, spiny specialised form. The skull is very similar to that of Pareiasaurus and Romer considered it a synonym of the latter. Orlov however (in Osnovy Paleontology, the monumental multivolume Russian textbook of Paleontology) placed it in the Elginiinae. Kuhn however argues that while resembling Elginia in the ossifications at the rear of the skull, it differs completely in proportions and would not seem to be related at all. Type species: Nanoparia luckhoffi Broom 1936 (Nanoparia pricei Broom and Robinson 1948 illustrated left would almost certainly be synonymous). Length of skull 12 cm. The question of turtle ancestry of Pareiasaurs is interesting but not resolved. It may well be that rather than evolving into turtles, pareiasaurs were evolving parallel to them. As such, pareiasaurs would represent "prophetic forms" rather than true ancestors. Deltavjatia vjatkensis "A recently discovered pareiasaur with numerous turtle-like skull features (e.g., a very high palate), limbs, and girdles, and lateral projections flaring out some of the vertebrae in a very shell-like way." the Creative Commons License 1.0 and a 2.0. Other other images are copyright their respective owners. images not loading? | error messages? | broken links? | suggestions? | criticism?